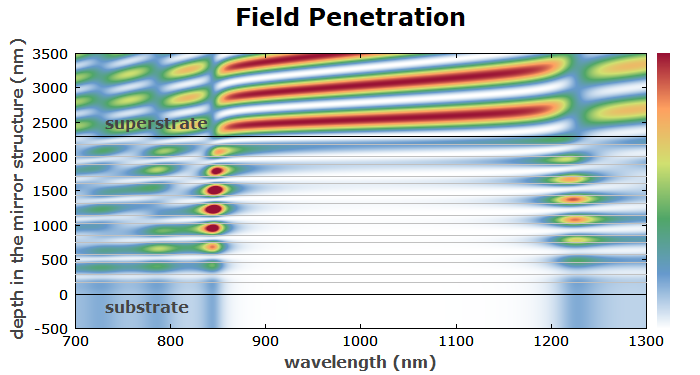 Abstract: This article explains how to make nice color plots in various software programs of RP Photonics. It is quite simple to use the cp: command in conjunction with predefined color scale functions. The most common type of data plot is the x−y plot, where the vertical position (y) of a point indicates some quantitative value depending on the horizontal (x) position. A serious limitation of that is that you can visualize only the dependence on a single variable. An extension of that is a 3D diagram where you have three mutually perpendicular coordinate axes. Unfortunately, most computer screens are still two-dimensional, and you can then only show a projection of the 3D diagram to the 2D screen. As a result, it becomes hard to read quantitative values from such a diagram; it gives little more than some qualitative impression. It can help only to a limited extent to use something like a mesh, reducing the ambiguity of the projection. A nice looking solution is to make color plots, where the function value corresponding to each x/y data point is encoded as a color. That avoids the problems of a 3D-to-2D projection and is also technically quite simple to realize. The limitation of that approach is just that our color vision is not that precise; while the projection problem is avoided, precise quantitative values are not obtained. In this article, I want to show you how to realize such color plots in our software, namely with the products RP Fiber Power, RP Resonator, RP Coating and RP ProPulse. The predefined function color&lowbar;I() converts values between 0 and 1 into color values, using a color scale which ranges from white (0) over blue (0.2), green (0.4), yellow (0.6), orange (0.8) to dark red (1). Thereafter, the field intensity for the given depth y in the structure is returned. From that, the color value is calculated according by the color scale function. That may seem to be a bit tricky in the beginning, but you quickly get used to that technique and can then make a wide range of nice color plots. You can also find a lot of them on this website. Our software offers only two different predefined color scales through the functions color&lowbar;I() and color&lowbar;A(). You have seen the former, and the latter accepts a complex argument with a modulus up to 1; the complex phase determines the type of color, and the modulus determines the color saturation. That function can be useful for plotting complex amplitudes, as obtained e.g. from numerical beam propagation. Of course, there are many other color scales which you might want to use. Here, you have full flexibility, because you can define your own arbitrary color scale functions. As an example, I show you how to implement the viridis color scale as explained here. That color scale is not defined through a simple formula, but rather through tabulated values, which you find in the file colormaps.py from https://github.com/BIDS/colormap/blob/master/colormaps.py. Once that is done, you can simply replace the function color&lowbar;I() with color&lowbar;viridis() in your scripts, and the new color scale is used!